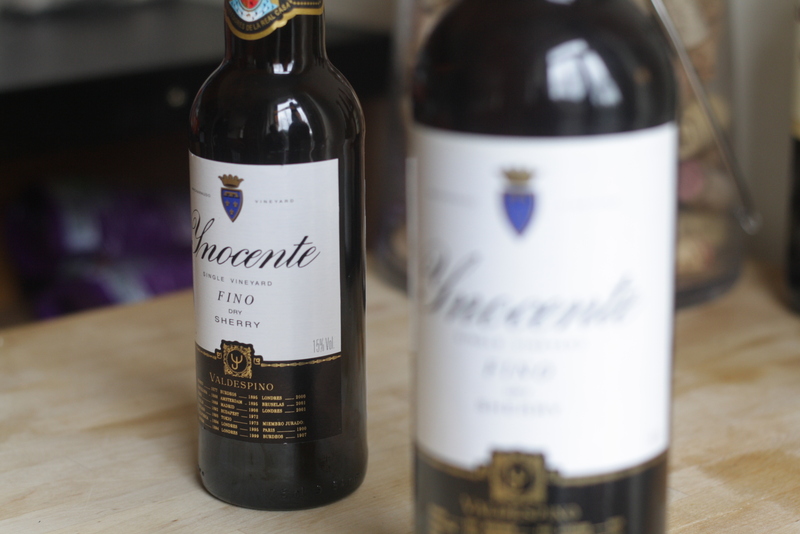 It’s day two of sherry week on The Vine Inspiration and we’re on to the good stuff. October 2013 saw the second incarnation of the, now hopefully annual, Great Sherry Tasting. The event was held in London and The Sherry Institute had arranged for many bodegas to send representatives to present their sherries. This was a fantastic tasting. It is said that the elders of Jerez would dip their handkerchiefs in sherry so as to have a sniff of the aroma throughout the day – the modern-day incarnation of such a custom is surely attending a tasting of this scope – over 150 sherries were open, and seeing as I made an effort to taste as many as possible, I knew exactly what my fellow tube passengers were sniffing queasily at on the way home – sherry was seeping from my pores despite my use of the spittoons provided. I attended two seminars on the day delivered by Beltrán Domecq (president of the Board of the Consejo Regulador). They had specific themes (Aged Fino and Traditional Ageing) but, in essence, one was delivered on biological ageing and the other on oxidative ageing. These were very interesting and I was tempted to blog about just these masterclasses, but to do so would mean omitting some of my favourite sherries of the tasting, as the sherries for the seminars were no doubt selected to highlight stylistic differences rather than necessarily being the being top sherries in each category. I’m a committed fino and manzanilla drinker – this has become very apparent over the last year. It’s perhaps only natural therefore that, when I’m seeking out a more complex and contemplative style of sherry, I no longer reach for an oloroso, but instead go for a fino that has pushed the boundaries of biological ageing in the solera system (flor does not last for ever!) or a bone dry amontillado, a style which, as I’ve already noted, showcases the best of both biological and oxidative ageing worlds. Today, I’m going to focus on some of the most enjoyable examples of these two styles that I found at the tasting. You really don’t need to have been drinking sherry for decades to appreciate that the sherries of Bodegas Tradición are exceptional across the board. 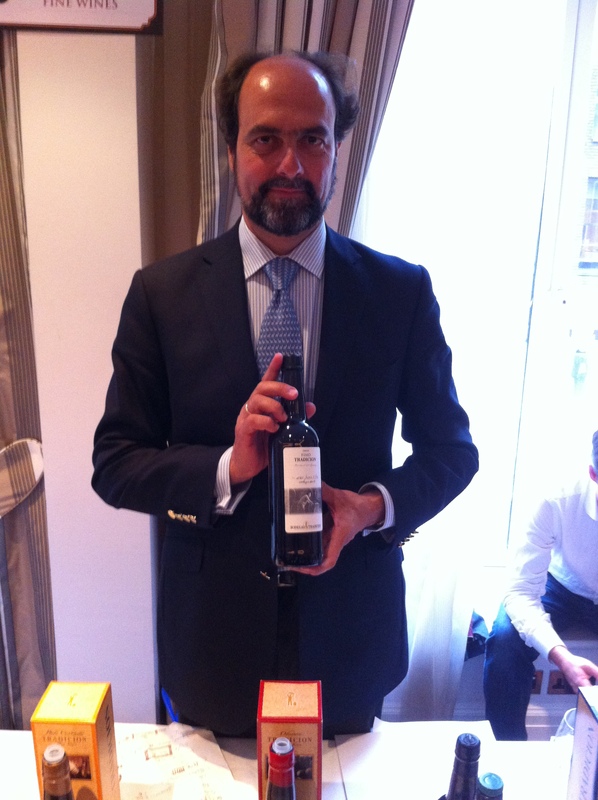 Lorenzo García-Iglesias Soto was on hand to present his new fino – a new venture for a company that has, to date, only produced amontillado, palo cortado, oloroso, and PX. All of the Tradición dry sherries are classified as VORS (Vinum Optimum Rare Signatum or Very Old Rare Sherry), with a minimum average age of 30 years, so it was no surprise that their “new” fino is also of considerable average age. When I asked Lorenzo why Tradición had decided to bottle a fino, his answer was very straightforward – the fino is already there in the bodega to refresh the amontillado soleras, and is of exceptional quality, so it was a natural progression to bottle it for people to enjoy. Tradición’s fino (UK rrp £30-£39) spends 12 years under flor, had a pungent nose and very good length. Tradición’s amontillado (£59-£79) was stunning – a big and intense nose with aromas of (ever so slightly) sweet citrus peel and nuts, with a true salted nut character emerging on the searingly dry palate. Not to be confused with Hidalgo-La Gitana, the Emilio Hidalgo range boasts two of the most outstanding sherries I tasted at The Great Sherry Tasting. Fino Especial La Panesa (£35.99) averages an astounding 15 years of age – it’s certainly the oldest fino, in terms of average age, that I’ve come across. Peter Liem notes in the book “Sherry, Manzanilla and Montilla” that this fino is indeed at the upper limits of biological ageing. The aromas in this pungent sherry were perhaps even knocking on the door of oxidative ageing, but it still managed to retain an intense yeasty character. It was full flavoured (yet still delicate), round and an absolute delight. As if that wasn’t enough, along comes the Amontillado 1874 El Tresillo (£66.48). This was arguably the greatest sherry I’ve ever tasted. It had everything. With an average age of over 50 years, this was truly an amazing sherry with incredible length and intensity but certainly not lacking elegance. How it still managed to retain such a distinctive flor character is beyond me. The Palmas range from González Byass is a selection of exceptional butts of sherry that are bottled unfined and unfiltered. 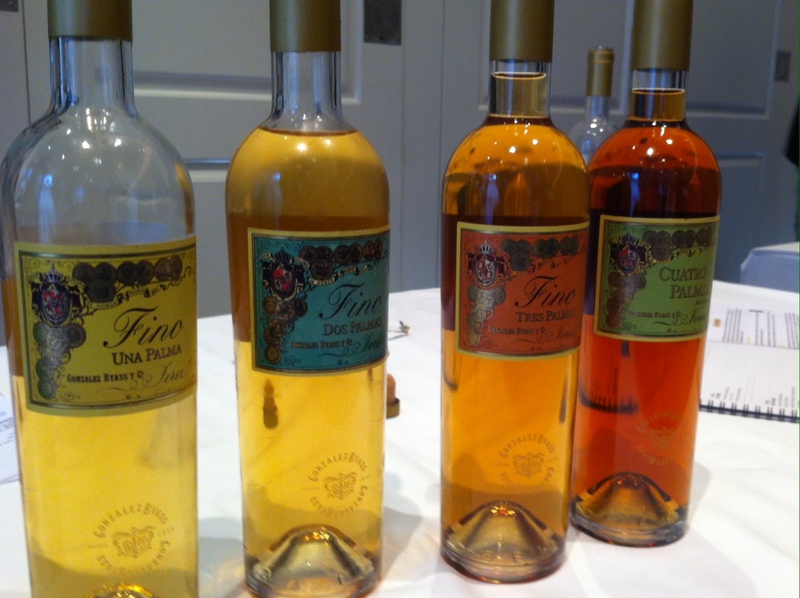 Una (£12.57), Dos (£17.18) and Tres Palmas (£37.33) are finos sourced from the Tio Pepe solera where they aged for 6, 8 and 10 years respectively. This is another case of “The Hobbit Part IV – Bilbo Baggins goes to Jerez”, as the individual butts are selected for their outstanding individual character – the butts are alive if you will! Cuatro Palmas (£75) is an amontillado sourced from the ‘Museo Solera’ and has an average age of approximately 40 years. Tasting the four Palmas side by side really shows the progression of fino to amontillado. The colour, which starts off at a medium gold straw yellow, gradually deepens until reaching the burnished copper / amber colour of the Cuatro Palmas. Of the 2013 releases, which incidentally were bottled only 4 days before this tasting, I particularly enjoyed the Una Palma for its overall balance; the Dos Palmas for its savoury spiciness; the Tres Palmas for its complexity (this could almost be considered an amontillado in character); and the mouth filling Cuatro Palmas for absolutely everything. Those who balk at the price of Cuatro Palmas might consider that this sherry is selected from 4 unique butts in the bodega. As such, Cuatro Palmas, in its current incarnation, is a finite commodity and there will only be three future releases. I’ve written about Valdespino many times before (and they’ll feature again tomorrow), so I will say no more other than to note that, if you want to really understand the relationship between aged fino and its sister amontillado, a bottle of Fino Inocente and Tío Diego Amontillado tasted side by side is a real eye opener. 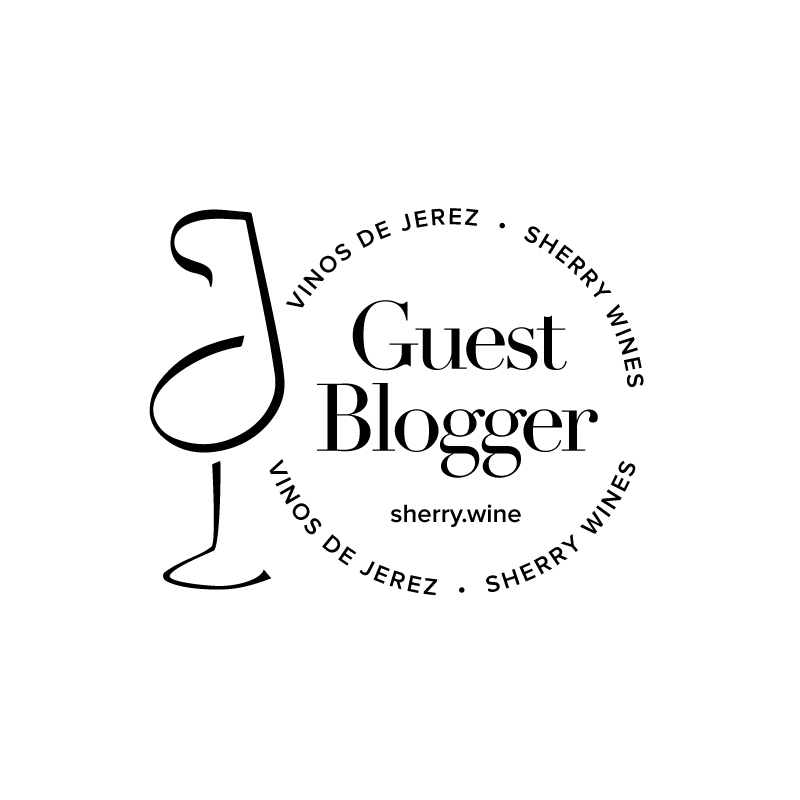 The extended biological ageing of both Inocente (relative to other standard fino) and Tío Diego (relative to other amontillado) makes these sherries quite an “acquired taste” – sherries that many balk at upon first tasting – I know I did anyway. Give it time, buy yourself a couple of bottles and stick with it – I promise that you’ll be rewarded. 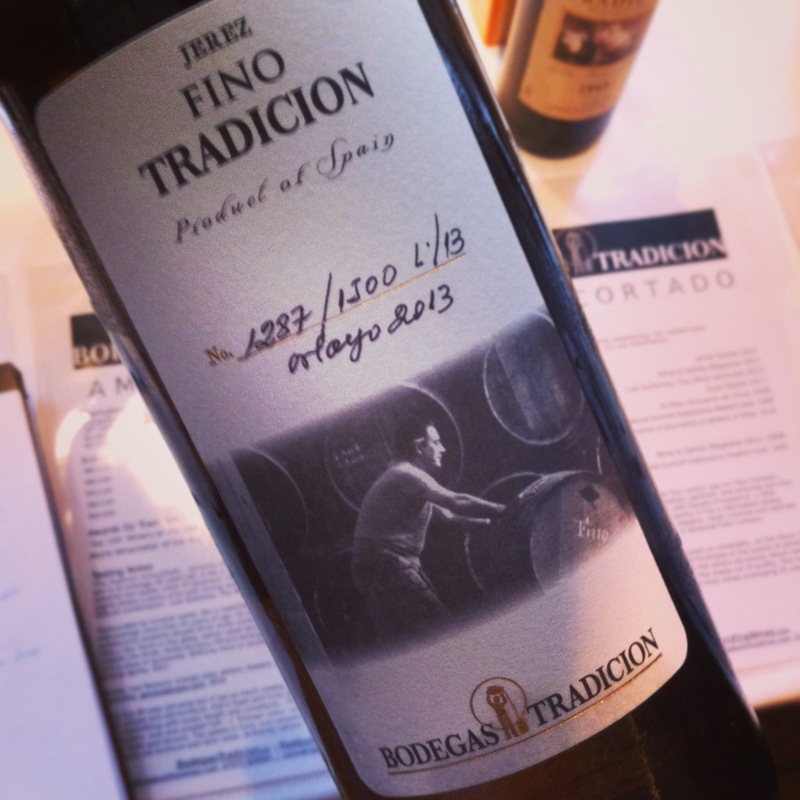 Bodegas Tradición – Imported by Raeburn Fine Wines in UK. Not currently available in Ireland. Stocked Fortnum and Mason if you are willing to run the gauntlet of checked baggage. Emilio Hidalgo – Available in Wines On The Green and Black Pig. Imported and stocked in the UK by Les Caves de Pyrene. Gonzalez Byass – not available in Ireland at present but potentially can be acquired through Berry Bros. & Rudd who operate an office in Dublin. Valdespino – Imported by Liberty Wines in the UK and semi-widely available in Ireland. I’ve bought bottles in 64 Wine and Donnybrook Fair. Also stocked reasonably widely in the UK.